Since May 2013, I am an associate professor at School of Philosophy of Wuhan University. 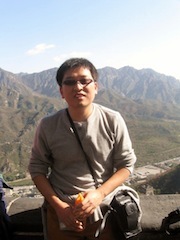 For 2012-13, I am a visiting lecturer and scholar at Philosophy Department of Cornell University. My academic work is primarily in moral philosophy. I am also the Book Review Editor for Dao: A Journal of Comparative Philosophy. (Title: Moral Partiality, Committee: Eleonore Stump (supervisor), John Greco, and Dan Haybron. (7) "Adaptationism and Early Confucian Moral Psychology", Asian Philosophy, Vol. 25, No. 1, March 2015, pp.99-111. (6) Review of Politics and Persons, (Beijing: Zhongguo Zhengfadaxue Chubanshe, 2012), Hao, Changchi, Dao: A Journal of Comparative Philosophy, Vol. 12 No.3, 2013, pp.407-410. (5) Review of Partiality and Impartiality: Morality, Special Relationships, and The Wider World, (Oxford: Oxford University Press, 2010), edited by Brian Feltham and John Cottingham, Journal of Moral Philosophy，Vol.10, No. 2, 2013, pp. 247-250. (4) Review of Confucian Relationalism, (Taibei: Xinli Chubanshe, 2009), Hwang, Kwang-Kuo, Dao: A Journal of Comparative Philosophy Vol.12 No.1, 2013，pp.121-4. (3) "The Confucian Puzzle", Asian Philosophy, Vol. 22, No. 1, April 2012, pp. 37-50. (2) “Evolution, Care and Partiality”, Asian Philosophy, Vol. 21, No. 3, August 2011, pp. 241-249. (1) “The Divine Command Theory of Mozi”, Asian Philosophy, Vol. 16, No. 3, November 2006, pp. 237–245. Copyright by Yong Li. All rights reserved.